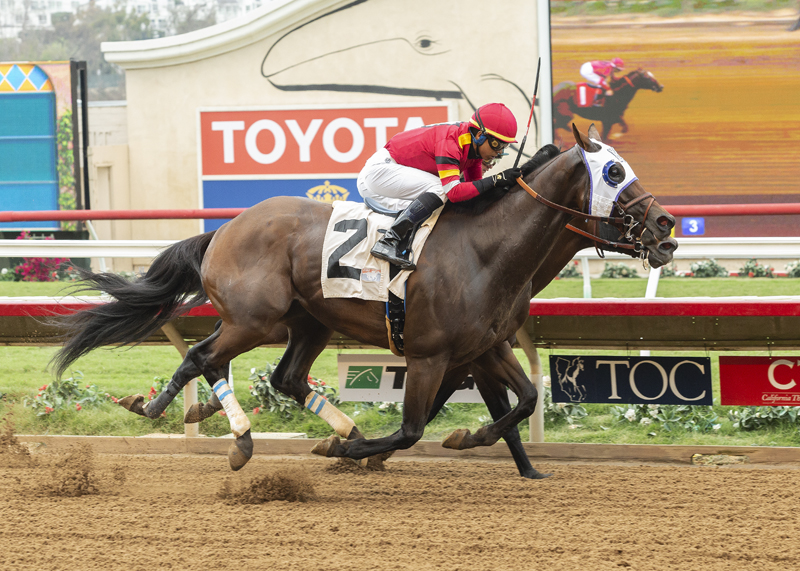 Ike Walker, a six-year-old gelding who dearly loves competing at Del Mar, scored his fifth victory in seven starts at the seaside track and twelfth over-all during a 42-race career with a typically game performance to win Thursday’s headliner. Seemingly beaten when 6-5 favored Lookie Lou drew off from him in the upper stretch, Ike Walker, piloted by apprentice Assael Espinoza, dug in determinedly to overhaul his rival in the final strides and win by a neck in 1:38.87 for the mile on the main dirt track. Ike Walker, a Kentucky-bred son of Bellamy Road trained by Hall of Famer Jerry Hollendorfer, went to the gate and 7-2 and returned $9, $3.80 and $2.80. Runner-up Lookie Lou, with Flavien Prat aboard, paid $3 and $2.10, while third-place Giant Influence returned $2.80 to show.